After a magnifique French-inspired Tea Time Treats theme in March, this month we've chosen one of the easiest bakes of all. We promise! And for the majority of us these were probably our introduction to baking. Quick, easy-peasy and loved by big and little children alike. Fairy Cakes, Cupcakes and Muffins! As always we welcome savoury and sweet treats. Send us your lovely entries by April 28th 2013. And a full list of details can be found here. perfect... i think I may even go and make some now! 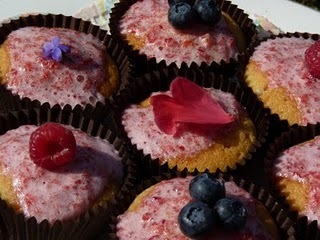 And I was just thinking it was time I made some cupcakes or did I mean fairy cakes - big or dainty that is the question. Hurrah! My favourite kind of bakes, something sweet coming up soon. Happy Birthday to your blog, you did make me giggle with the prospect of the terrible twos!